Happy Monday! I hope you all had a great weekend! My husband and I have decided to start a monthly tradition of a family date to the movies. Last month, we saw The Greatest Showman together and this past weekend we took the girls to the movies again. This time, we saw Peter Rabbit and all four of us loved the movie. Josh and I found ourselves laughing out loud quite a few times! It was a really great movie for the whole family. I would definitely recommend it! I feel like my Monday posts are just so random lately but I kind of like them that way! I am basically just rounding up what's on my camera roll and things that I shared on my Instagram Stories. Today, I'm sharing a couple Target try ons that I did over the weekend and some recent purchases for my girls. I get a lot of questions about what my girls are wearing when I saw pictures on them on Instagram so I thought it would be fun to share some of the items that I have recently purchased for them. This top is such a great find for only $15! 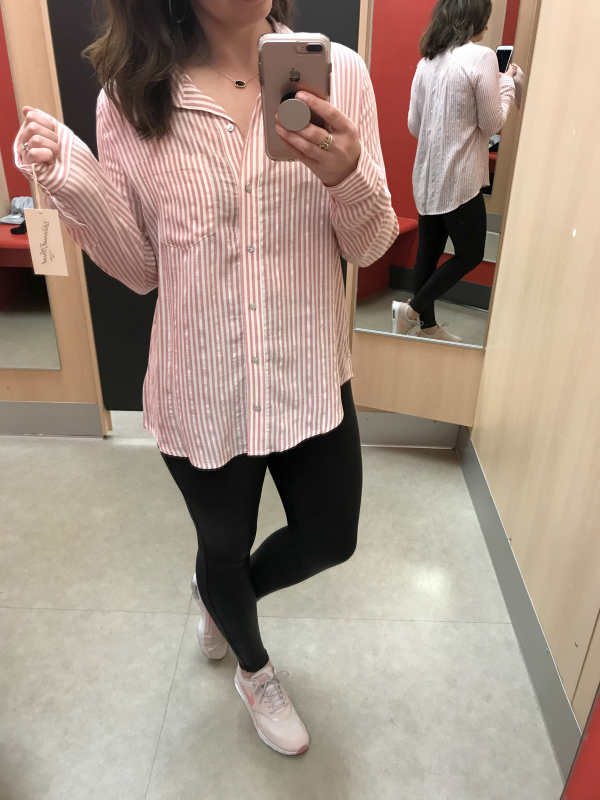 I tried on the size medium so I would definitely recommend sizing up one size because I found it to run a little bit short on me. This would be so cute paired with boyfriend shorts for summertime! Online this top says it's "red" but it's definitely more pink in person. The material is so soft and breathable, too. 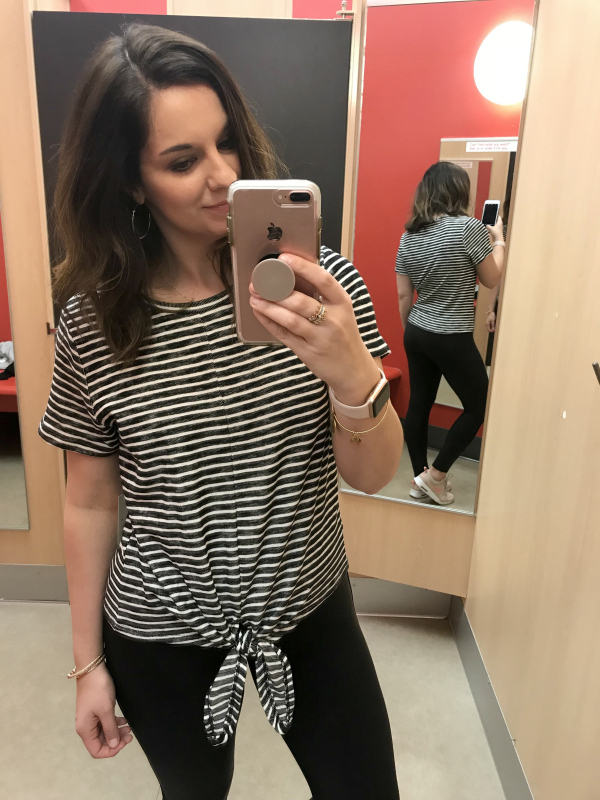 I sized up to a medium for a more relaxed for a longer length to wear with leggings and skinny jeans. I would also wear this under my overalls! It's such a great basic top that can be worn in so many different ways. It also comes in a pretty purple striped option as well! My daughters are seven and five (26 months apart). I almost always dress them in the exact same outfits or something super similar. When I'm checking out at any store, I either get asked if I have twins or if I'm not sure what size my kid wears because I'm buying multiples of the same items. 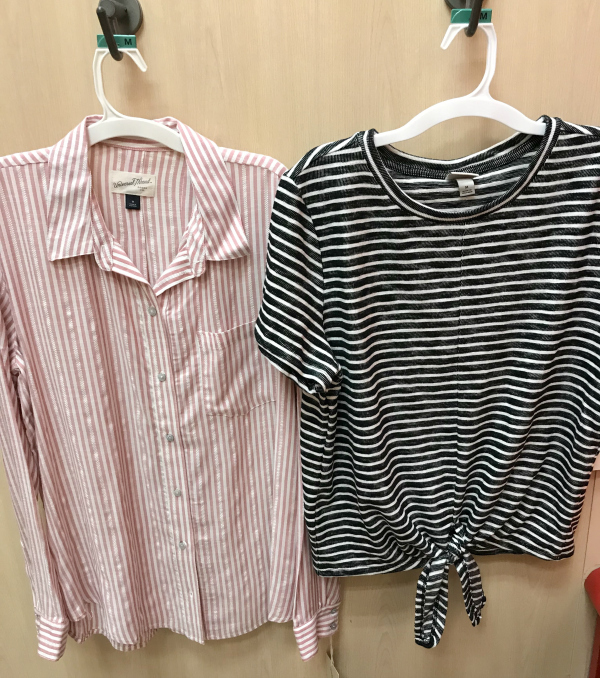 I dress my girls the same for two reasons: it makes my life so much easier to pick out the same outfit for them and because they are little girls that get jealous if their sister's outfit is "better" than theirs. Little girls are complicated, lol. But on Saturdays, I let them choose their own outfits (within weather constraints) and this is honestly kind of hard for me to let go of control of their outfit because I love dressing them. However, it's fun for them and interesting to see what they come up with. My seven year old chose jogger pants and glitter ankle boots this weekend. I would have never chosen that combo for her but she rocked that look with confidence!